With decades of experience in developing photoelectric sensors for harsh environments and utilising specific housing materials, Banner Engineering is fully conversant with the requirements of all major industry sectors. Today this technology is employed in their rapidly expanding LED Lighting range, perfectly illustrated in the new WLS27 striplight family. Featuring a durable aluminium internal structure and shatterproof, UV-stabilised, polycarbonate shell, WLS27 LED striplights are ideal for harsh indoor and outdoor applications and resist exposure to high-pressure, high-temperature water, solvents, cutting oils and a broad range of chemicals. The smooth, no-crevice design enables thorough high-pressure cleansing, vital in food and beverage applications. WLS27 LED striplights provide brilliant, even illumination in difficult environments. A redundant sealing method prevents water ingress to achieve IEC IP66, IP67, and IP69K ratings. These cost-effective LED light strips will provide vivid, low-power, maintenance-free illumination throughout their lifespan of 50,000 hours or more. A unique feature of the range is the built-in automatic temperature protection. 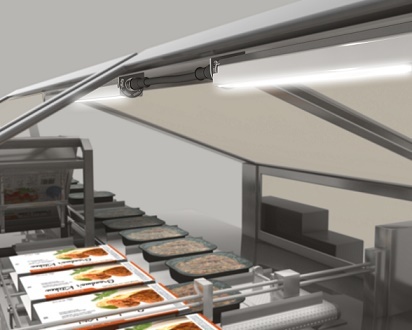 Above 50 °C, the light dims to manage heat and protect product lifetime. WLS27 LED striplights are optimal for use where laminar airflow is a requirement. To satisfy diverse applications, the WLS27 is available in eight lengths from 145 mm to 1130 mm. They are available as either stand-alone, or as cascade models that can be “daisy-chained” together for a continuous length of illumination, with a minimum of wiring. Multiple colour illumination options, including single, dual and dimmable configurations are available. Colour options include cool white, warm white, red, green, blue and yellow. Dual-colour models feature two colours in one light strip, which maintains the same intensity as single-colour models. WLS27 LED striplights are offered with flexible mounting options, allowing users to deploy them in areas and applications where other lights may not fit. Optional snap clips are also available for simple installation and repositioning. These striplights are an ideal general-purpose LED light for machine, enclosure, or other industrial lighting applications. Two colours in one device make them ideal for mobile vehicle, machine status, and vision lighting applications. A car wash can have multiple illumination needs, all of which are challenged by conditions at the facility. Moisture is ever present. Light fixtures will be regularly exposed to steam and mist, high-pressure, high-temperature water, soap and other cleaners, as well as hot wax. Weather and temperature extremes can compound these challenges. Light fixtures used in these conditions can have short lifespans and often require frequent maintenance, draining labour and other resources and cutting into the operating time of a wash bay. Banner’s M-Gage Q7LMEB sensors detect when a vehicle is present in a wash bay. A 430 mm dual-colour, stand-alone WLS27 is installed over the entrance to each wash bay. When a bay is free, the light will shine high-visibility green and when it is occupied it will shine brilliant bright red, providing clear, unambiguous indication of wash bay status. Each bay is illuminated by eight single-colour WLS27 fixtures. Overhead lighting is supplied by two stand-alone 1130 mm fixtures which direct vivid, cool white light down into the bay. Illumination along the sides of each bay is provided by 710 mm WLS27 light fixtures installed in groups of three into niches between the bays. These lights are cascaded together to reduce wiring complexity and their compact low-profile further facilitates installation into the niches, reducing the overall time required for each deployment. These lights have dimming capabilities, which allow the facility to adjust the intensity of the lights. When a wash bay is vacant, the lights will dim for greater energy savings.